Edinburgh city centre could become a “largely traffic free zone” under a radical proposal to be put to the public. One of three options put forward by the city council says “key streets could be pedestrianised” while hubs could be built for buses to drop off passengers to use “less impactful transport”. It is not yet clear whether buses would be able to travel through the city centre. The document, called ‘Connecting our cities, transforming our places’, explains three approaches to potentially overhauling the future of transport in the Capital. with controls in place to allow for essential traffic and with pedestrian priority in the city, town, and local centres. It adds: “There would be strategic walking routes and segregated cycle routes across the city with a citywide wayfinding network to guide pedestrians around the city. The report points out that the three options are not mutually exclusive. Subject to approval of the council’s Transport and Environment Committee, the eight-week public engagement will start in September – with further public consultation on detailed proposals set to be held early in 2019. 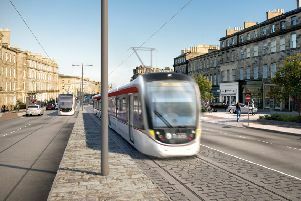 Transport Convener, Cllr Lesley Macinnes, said: “It’s very much about trying to find out how much of a vision people are willing to embrace and what we then need to do to deliver that. “We are very conscious that we have a city centre residential population in marked contrast to many other cities. We need to take care of their needs and expectations of where they live. It’s also about those who visit and those who come into the city centre. She added: “We are going forward with consultation with the public on three projects which are being brought together quite unusually to form a single consultation around the Low Emission Zone, the next city mobility plan and the city centre transformation.